There are no strict rules to finding perfect wine and cheese combinations because choosing wine and choosing cheese is really a matter of personal preference. Though there are no strict rules when matching the right wine with the right cheese, due to the strong flavors in certain cheeses and wines, there are a few guidelines. Matching by intensity of flavors - Big, intense wines generally match well with cheeses that have strong flavor characteristics and light, fruitier wines generally match well with creamier, mellow cheeses. Pair hard cheeses with red wine. Pair soft, creamy cheeses with white wine. Matching wine and cheese by region isn't a failsafe and doesn't guarantee that the two will marry well together, but it's a good general guideline to use. So, if you're drinking an Italian red, pair it with an Italian cheese like Parmesan, Asiago or Gorgonzola. If you're drinking a nice French white, choose a French cheese like Boursin, Camembert or Rouquefort. To get you started on your wine and cheese matching journey, here is a list of cheeses that pair well with white wines. Oaky and buttery Chard's are more difficult to match with cheese than young, acidic un-oaked Chard's. So, think the creamier the cheese, the less oaky and buttery the wine. Sparkling wines and Champagne go well with cheese that has a higher milk-fat content because the crispness of the sparkling wine and Champagne, along with the carbonation, easily cut through any fat that coats your palate. Remember, big reds need strong flavored cheeses to stand up to its strong flavor characteristics. Mellow reds like Pinot Noir and Merlot pair well with medium flavored cheeses but can also go with a few stronger cheeses as well. Some cheese and wine matching traditions state that reds are best with cheese because they can stand up to its strong flavors. Other experts say this isn't so because the strong flavors in red wine and good cheese clash, so whites are better due to their higher acid content. The only thing that everyone (almost) universally agrees upon is that a strong Stilton cheese is best with Champagne or a nice port wine. More and more high-end restaurants now have Sommeliers and Fromageries (think the expertise of a Sommelier, but with cheese instead of wine) and even they can't agree on the perfect cheese and wine marriages. More importantly, most people don't possess the highly developed palate for wine like a Sommelier nor can they taste all the nuanced flavors of cheese like a Fromagerie. Therefore, the only thing people can do is experiment with wine and cheese pairings on their own. Go ahead and try nutty Asiago with an oaky California chard. No one's going to be mad at you. 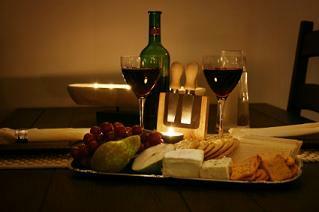 The above lists are merely suggestions of a few good wine and cheese matches. Cheese, like wine, is completely subjective and a matter of personal tastes.